As the world's busiest airport, Hartsfield-Jackson Atlanta International Airport serves as a major connecting point for the Southeast, including the Atlanta metro area (7 miles away), as well as an international gateway and as a hub for TransAir and as the world's largest hub for Delta. The Atlanta International Airport (ATL), serving a large number of airlines and destinations, has 197 gates and over 5 million square feet of space (see diagram below) in the North and South terminals for checking in and claiming baggage, a large atrium between the terminals with food courts and shops and six parallel concourses for passenger boarding, with concourse 'T' (for 'Terminal Gates') next to the terminals and adjoining concourses A, B, C, D and E (international passengers), connected by a Transportation Mall down their centers, with a pedestrian walkway, moving walkways and the Plane Train. Ground Transport. 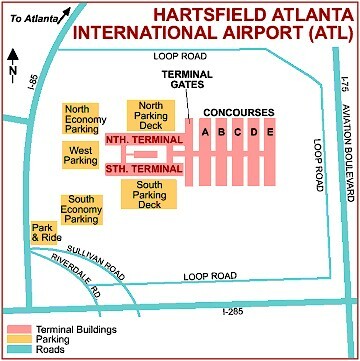 Atlanta International Airport is served by Interstates 75, 85 and 285 and its own MARTA regional transit station located between the main terminals. Taxis and Rental Cars. Taxis and limos are available at the airport along with rental cars, the most economical way to get around. The Hartsfield–Jackson Rental Car Center, handling all rental car agencies, is reached by the ATL Skytrain at its station next to the MARTA station, with easy access to I85. The ATL Skytrain also connects the Georgia International Convention Center. Destination. This destination is itself well worth at least a layover mini-vacation on its own. Accommodations. A wide range of accommodations are available near the airport and in the Atlanta metro area. (see info and rates). Close to the airport and next to the Georgia International Convention Center, the Marriott Gateway Atlanta Airport (see rates-low price guarantee) is connected to both via the ATL Skytrain. US Non-Stop/Connecting Airports. The major US airports for non-stop flights to the Caribbean as well connecting service include Miami (American), New York (American, JetBlue, Delta), Atlanta (Delta with the world's largest hub), Chicago (United and American,) Los Angeles (United and American), Philadelphia (US Airlines), Houston (Continental) and Dallas Fort Worth (American, the most important Caribbean carrier, with its main US hub). Delays and Overnight Stays. Luggage and flights may be delayed so carry on an overnight bag with a day's necessities, including medicines, clothing and a bathing suit as well as reading material and snacks if desired.